How many trips do your maintenance room employees make to the same 55-gallon drum site for X amount of oil or lubricant? Two? Three? More? And how far do they have to go to where the lubricant is needed? What about trips for oil cans, rags, grease guns, wrenches, etc.? And how much fluid that you’re paying for gets spilled? What about inventory control? Do you need to store extra product, just in case you run out? Or have you had to endure downtime because you did run out? And what about making your employees’ jobs less physically taxing – with less risk of injury and the expense that can entail? If eliminating all of these time and productivity wasters makes buying a lube cart sound like less of an expense and more of an investment, you can work it out for yourself. Using a base price of $6,000 for a cart such as the one shown, use the Lube Cart Labor Savings & Investment Payback Worksheet to calculate how much you’d save in what time frame. Interested in more information? Please fill out the form below. Selecting the right material is critical. Most hydraulic reservoirs are manufactured from steel, stainless steel or aluminum. But, another option is aluminized steel. The use of aluminized steel (sheet steel hot dip coated on both sides with an aluminum-silicon alloy) solves the contamination problems inherent in uncoated steels. It combines the corrosion resistance of aluminum with the structural strength (and lower cost) of steel. Aluminized steel is price-competitive with hot or cold rolled steel. Reservoirs made of aluminized steel can help prevent corrosion from nearly any external influence. Aluminized steel reservoirs are compatible with nearly all petroleum-based and synthetic fluids. The IFH Group has pioneered the use of aluminized steel in hydraulic oil reservoirs and fuel tanks for off-road and specialty vehicles used in agricultural, construction, utility and a range of other rugged off-highway applications. Depending on the application, environment and size of the reservoir, the use of aluminized steel can be a viable design option. When someone reaches out in need of a hydraulic reservoir, a few introductory questions can determine the options and services you’ll need from your tank provider. What kind of environments will the application be introduced to? Is the reservoir a new or existing product? Depending on the application, environment and size of the reservoir, the use of aluminized steel is recommended. The use of aluminized steel (sheet steel hot dip coated on both sides with an aluminum-silicon alloy) solves the contamination problems inherent in uncoated steels. It combines the corrosion resistance of aluminum with the structural strength (and lower cost) of steel. Aluminized steel is price-competitive with hot or cold rolled steel. Beyond aluminized steel, you have a wide array and variety of materials including but not limited to hot rolled steel, cold rolled steel, aluminum and stainless steel. Typically, you should look for quotes in multiple material options so you have the best option for your application. Do you have any sketches? While a space void or constraint for the reservoir is helpful, a preliminary sketch or print provides the groundwork of the design and gives us an idea of the manufacturing efficiencies we can utilize. Your tank supplier should enjoy the collaborative process to find the most cost effective design to fit the your application while providing a reservoir that exceeds expectations but maintains a competitive cost. Keep it as simple as possible. Anything complex – complex corners or edges, trapezoidal shapes, irregular rectangles – means more material, more labor and more leak test time. Make sure your supplier can procure and install the value-added parts you need – fill caps, strainers, sight bulbs, filters, straps, covers or any type of value added item that may be required. Look for suppliers with strong, key relationships with manufacturers of these value added items, often receiving discounted pricing – a savings that is passed onto the customer. With a little planning, and a collaborate partner in your tank supplier, you should end up with a finished product that is ready for mounting and plumbing of the connections. Every tank and reservoir you receive should be thoroughly cleaned and tested based on a your own standard or an industry standard. Also, when your tank supplier takes on the task of installing the value added parts, it diminishes the introduction of contamination during the reservoir installation process. For a worldwide company like pharmaceutical giant Eli Lilly and Co., it is a dedication to excellence in machinery lubrication. Since taking the reins of Eli Lilly’s corporate lubrication technical team, Rendela Wenzel created a lubrication assessment and an end-user guide to assess each manufacturing site’s overall lubrication program performance. The assessment covers seven different sections – storage, handling/dispensing, safety, training, lubrication PMs, oil analysis and recycling. When reliability and predictive maintenance in general were not improving as quickly as desired, Eli Lilly’s management realized that some areas were better than others in the reliability space and as a result started to integrate these improvements into their business plans. For storage and handling and dispensing, the company turned to storage and dispending systems from The IFH Group. 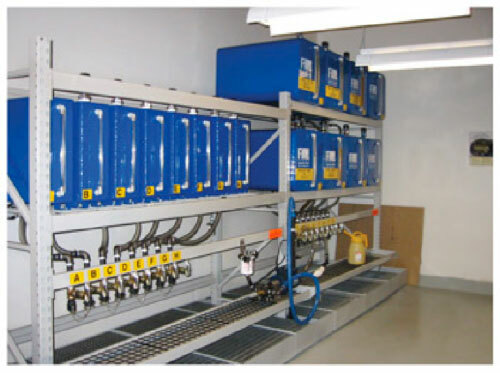 The IFH Fluid Storage and Dispensing System improves lubricant storage by providing a better way to handle all kinds of oils, lubricants and industrial fluids that is easier, safer, cleaner, and more cost efficient. Written by Warren Byers is the owner of M. W. Byers Co., Carnegie, PA.
Do you have questions about the finer points of mobile hydraulic oil reservoir design? And the special design considerations that mobile reservoirs require? Mobile hydraulic reservoirs are expected to perform as well as industrial reservoirs, even though they are typically operating under more extreme and often adverse conditions. It’s important that you (or your reservoir supplier) understand the special problems hydraulic reservoirs used in mobile equipment face, such as machine motion, extreme ambient temperatures, and size limitations. Size is the most striking difference when comparing industrial and mobile designs. Industrial standards, developed by NFPA (National Fluid Power Association) and accepted by ANSI (American National Standards Institute), specify that reservoir capacity should equal 3x to 12x maximum pump output. However, size and weight limitations may require the equipment to operate with reservoirs as small as the volume the pump discharges in a single minute. Because of the special limitations of mobile hydraulic reservoirs, they typically require custom design. Custom made hydraulic reservoirs have an advantage over off-the-shelf reservoirs because they can be designed to fit the exact space and technical requirements necessary for optimal performance. Cost, size, and weight can be minimized while maintaining performance and efficiency. Does your supplier employ techniques such as 3D modeling to develop the most efficient design for your application and for the manufacturability of your reservoir? Details on design considerations for mobile hydraulic reservoirs can be found on our website in a free white paper download by IFH Group president Keith Ellefsen. Ryan McCarty is Vice President, Sales & Marketing, at The IFH Group. He can be reached at rmccarty@ifhgroup.com. 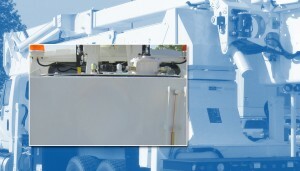 Do you need a custom mobile hydraulic reservoir? Mobile reservoirs for off-road vehicles are more than storage tanks for hydraulic fluid. Though their prime function is to act as storage containers for hydraulic fluid, they should also function as fluid conditioning devices. They can not only provide fluid to meet varying demands as actuators extend and retract, but can also prepare the fluid for its next working cycle. Mobile hydraulic reservoirs are expected to perform as well as industrial reservoirs, but since they operate under adverse conditions, they require special design considerations. Machine motion and extreme ambient temperatures are but two examples of the special problems designers and manufacturers of hydraulic systems in mobile equipment face. When comparing industrial and mobile designs, size is perhaps the most striking difference. Industrial standards, developed by NFPOA and accepted by ANSI, specify that reservoir capacity should equal 3 to 12 times maximum pump output: today this may exceed 2000 gallons. However, size and weight limitations may require the equipment to operate with reservoirs as small as one time pump output. Because of the special limitations of mobile hydraulic reservoirs, their design and build must be fully developed. Cost, size, and weight must be minimized while maintaining performance and efficiency. Custom made hydraulic reservoirs have an advantage over off-the-shelf reservoirs because they can be designed to fit the exact space and technical requirements necessary for optimal performance. Reservoir manufacturers should maintain a complete engineering department to assist in developing the most economical and practical hydraulic reservoir design. Aluminized steel (sheet steel hot dip coated on both sides with an aluminum-silicon alloy) can be used to solve the contamination problems inherent in uncoated steels. It combines the corrosion resistance of aluminum with the structural strength (and lower weight and cost) of steel. Aluminized fuel tanks are resistant to virtually all petroleum-based and synthetic fluids while providing excellent protection from atmospheric corrosion. These tanks can be readily welded using resistance, MIG, TIG or robotic welding processes and can be formed using normal methods, with no peeling or flaking of the coating. With any hydraulic reservoir, the quality of the weld is all-important. Any competent manufacturer should combine MIG, TIG, robotic and electrical resistance welding to provide hydraulic reservoirs of the highest quality. Manufacturing equipment should be state-of-the-art, including CNC turret punches, CNC controlled forming equipment and CNC controlled welding equipment. Powder coating is the future. Increasingly stringent environmental regulations, rising costs in all areas, and demands for better quality and more durable products make it the smart choice for a better looking, more durable finish. The main difference between a conventional liquid paint and a powder coating is that the powder coating does not require a solvent to keep the binder and filler parts in a liquid suspension form. The coating is typically applied electrostatically and is then cured under heat to allow it to flow and form a “skin.” It creates a hard finish that is tougher than conventional paint. Reservoir servicing must also be taken into account. There must be provisions to drain both return and suction areas of the tank, especially if a baffle is used to separate them. Pipe couplings are often used, but SAE O-ring ports provide better sealing. Valves should also be provided for closing off inlet lines when replacing pumps or other components that are below fluid level. Access should be provided for cleaning and maintaining the interior of the tank. Clean out covers should be large enough for service personnel and cleaning tools. There should also be means for lighting each portion of the tank for inspection. Clean out covers should be attached to the tank so leaks can be detected and repaired from the outside. Can filters be added to my lubrication storage and dispensing system? 1. Quick connect filter adapters can be added to most existing and operating IFH Group systems. 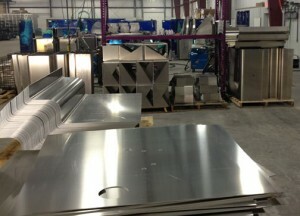 These simply filter the oil as it is transferred into the 65 gallon containers on the rack. They are quick and easy to install, and are an economical way to add filtering to an existing system. 2. Our diverter valve systems provide optimal contamination avoidance. Each container gets its own filter and transfer unit, so there is never cross contamination. The lubricant can be filtered when filling the 65 gallon container, when dispensing, and can even be recycled while in the container continuously through the filter to achieve additional contaminant removal. 3. An IFH lubrication cart can be used to transfer oil from the storage system to equipment. The cart can incorporate a filter so that oil is filtered a final time before being delivered to equipment. For more information, contact Ben at bwolf@ifhgroup.com. How can I combat corrosion in hydraulic oil reservoirs? This 109-gallon capacity hydraulic oil reservoir is fabricated from aluminized steel and is used in an aerial work platform bucket truck. It includes a sight gage, filler-breather, and filter. Reservoirs made of aluminized steel can help prevent corrosion if moisture does get into the reservoir. Aluminized steel is sheet carbon steel that is hot-dip-coated on both sides with an aluminum-silicon alloy to avoid the contamination problems inherent to uncoated steels. Essentially, aluminized steel combines the corrosion resistance of aluminum with the higher mechanical strength — and lower cost — of steel. Aluminized steel reservoirs are compatible with virtually all petroleum-based and synthetic fluids while also providing protection from atmospheric corrosion. How can I safely store chemicals and abrasive fluids? Storage and dispensing of chemicals and abrasive fluids such as Heat Transfer Fluid, Rust inhibitors, Ethylene Glycol, Glygoyle 30 and Anti-Freeze can be a problem for the lube room maintenance engineer. How to do it safely and efficiently? One solution is a Special Product Package designed for applications involving chemicals and abrasive fluids that require special handling. Designed by the IFH Group, the standard PVC sight gauge on the front of the steel containers is replaced with a Glass Sight Gauge equipped with ball check fittings at both ends. Underneath the containers are 3/4″ NPT fittings and Flex Steel Hose for resistance to fluids that may damage the PVC hose on standard IFH systems. The Special Product Package can be supplied with new IFH fluid storage and dispensing systems or as a retrofit to existing systems. The engineering time involved in the customization process is completely cost free. No extra charges are incurred for special designs, only for additional special equipment. How do I deal with dusty conditions in my lube room? Dusty conditions should certainly be considered carefully. The standard vents have a coarse screen that keeps large items from entering the containers, but for filtering the air that is drawn into the containers, a desiccant air breather should be considered. The IFH Group can supply these with a new system or they can easily be retrofitted. The desiccant breather not only filters the air being drawn into the container, but it also removes moisture from the air that will go into the container. This is particularly useful in damp or humid conditions.